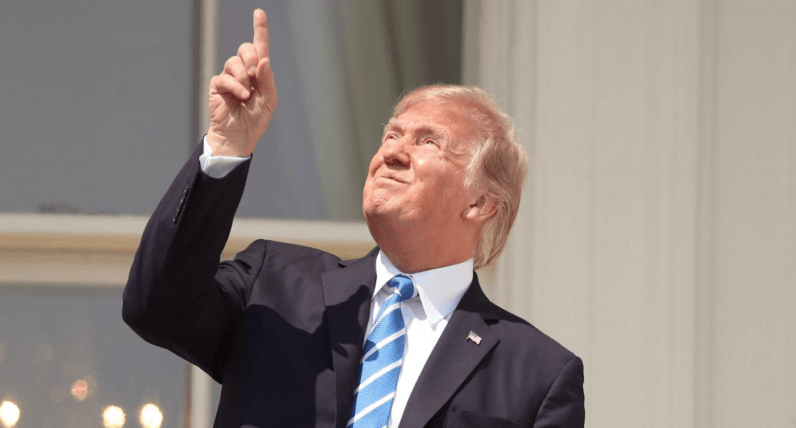 Yesterday Donald Trump proved his unbreakable spirit yet again when he ballsily squinted into the solar eclipse – a move that some have since touted as “perhaps the most impressive thing any president has ever done.” But as Google Trends reveals, Trump wasn’t the only dumbass to stare right at the eclipse. Searches for the key phrase “my eyes hurt” went absolutely through the roof in the immediate moments after the solar eclipse; and as you probably guessed, statistics seem to suggest there might be a direct co-relation between the two events. While interest in the term “solar eclipse” started gradually increasing at around 5:30 PM ET, it suddenly soared around 6:25 PM ET to reach its peak at 7:20 PM ET. Once the eclipse was over, searches immediately sunk down around 8:20 PM ET and remained low for the remainder of the day. Coincidentally, it was around 8:20PM ET when searches for “my eyes hurt” suddenly began picking up traction, until eventually reaching their peak at 8:56PM ET – right around the time when media outlets started wrapping up their eclipse broadcasts. Though the figures are pretty telling on their own, overlaying them seems to reveal the link between the two even more clearly: At the same time when searches for “solar eclipse” began declining, searches for “my eyes hurt” began gathering momentum. So the good thing is that only a tiny fraction of spectators seems to have made the mistake to peek directly at the eclipse. Meanwhile, The Guardian has put together a guide for those that fear they might have sustained eye damage during the solar eclipse. You can check out the symptoms here.